About 4pm this afternoon Carnival Conquest spotted a raft with 13 people (shown below) about 40 miles off the coast of Key West. After consultation with the Coast Guard, the 13 Cuban nationals were taken aboard Carnival Conquest and given food, water and medical treatment. A Coast Guard vessel was to meet the Carnival ship this evening to take charge of the individuals. 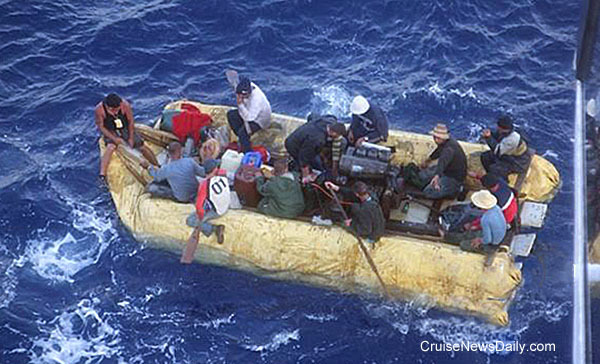 Since they did not reach land, in all likelihood they will be returned to Cuba. Copyright Cruise News Daily and Carnival Cruise Lines. May not be copied or reproduced without permission.